Levels of glucose in the plasma are determined by the rate at which glucose emerges from the gastrointestinal tract as well as the rate of glucose production by the liver. Glucose serves as a stimulus for insulin secretion from the pancreas, which influences the rate of glucose uptake by both liver and muscle. 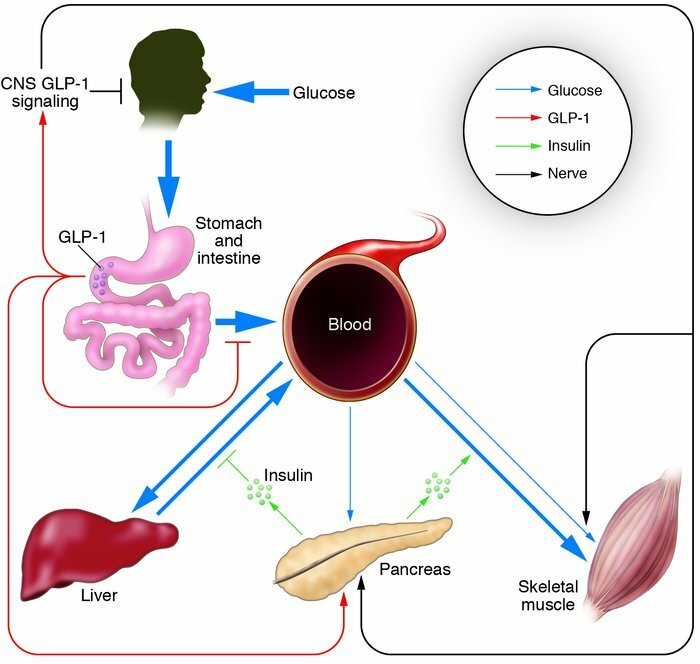 GLP-1 secreted by the intestine inhibits glucose appearance by inhibiting both nutrient intake and gastric emptying rates while stimulating insulin secretion to facilitate muscle and liver glucose uptake. In this issue of the JCI, Knauf et al. (11) provide compelling evidence that GLP-1 signaling in the CNS also serves to increase non–insulin-dependent glucose uptake by muscle and stimulates insulin secretion via neural connections to these tissues.